Horse riding is permitted in the park on fire trails and the beach front south of the Beach Access Track. Registration is required prior to entering the park. Beach Front – South of Beach Access track only(flat tidal zone). No access to beach or dunes north of Beach Access Track including Third Creek area. ​Where can I park horse floats? Strictly no horses are to be ridden in any dune areas. All riders enter the park and undertake activities at their own risk. All horse vehicles and trailers should be parked next to the Kalaroo Fire Trail gate during normal park operating hours or not obstructing other entrances when main gate is closed. Riding is only permitted on flat tidal zone of Beach front (not in dunes) south of Beach Access Track and designated fire trails. 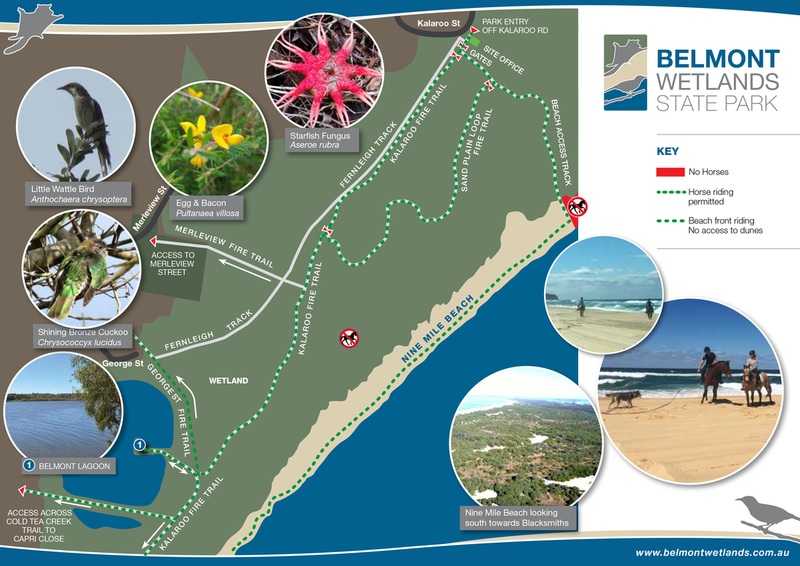 No access to vegetated areas, sand dunes or walking tracks is permitted. i) NSW road rules apply. ii) Speed limits are enforced. iii) Pedestrians have right of way. iv) Be mindful of other park users such as mountain bike riders, walkers and 4-wheel drivers. v) Take all waste away including animal, fire and human waste. vi) Dogs must be kept under control. vii) In an event of a major bushfire, listen to emergency broadcasts on ABC radio.